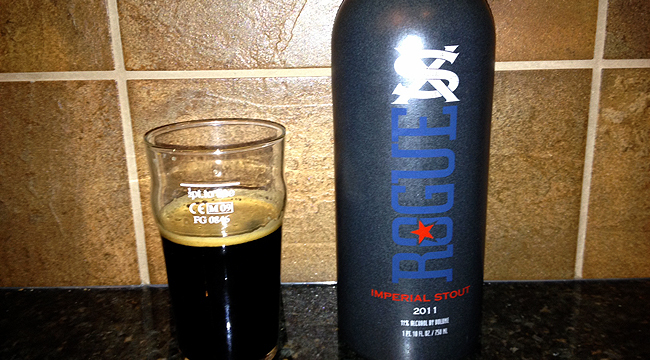 This awesome brew showed up at my place in a black ceramic 750ml bomber with a flip cap. It would make an excellent growler if I could find a place that would fill it. Instead it will take up residence near my very select collection of ultra-cool bottles. As for the beer, I could complain that this brew isn’t really true to the Imperial Stout style because it takes a couple alternate paths. Instead, I’ll just explain why that’s a good thing. The pour was not surprising: this one filled the glass with a thick-looking and inky-blackness for which big stouts are known. A low and dark tan head forms with little carbonation present. Although these beers are supposed to be dark, the sheer blackness that this beer produces is still impressive. The alcohol content is embellishing the style guidelines a bit at 11% ABV, but quite a few breweries are taking that route these days. The real surprise with the Rogue XS Imperial Stout is the hop complement. A bouquet of Pacific Northwest hops seemed out of place as I lifted the glass, but as soon as I started drinking it all made sense. This beer favors caramel and oak flavors (with maybe a hint of vanilla) that blend with the strong hop presence extremely well. This beer finishes with a lingering bit of ethanol and a remaining sweetness along with strong roasted notes. Overall it is a great brew that embellishes the style rather than challenging it. One of the better big stouts I’ve had, actually. A couple quick warnings – let this one warm up a bit. It will be close to 50 degrees before it truly hits its prime. Also age it for about a year. I only know this because that’s what all the cool kids are doing with the big beers these days. This one was a year old and it may have been a bit too aggressive had it not aged. This beer isn’t really one to pair with food in my opinion. Of course, you can grab some snacks to go with it if you’re so inclined, but be aware: this beer will control-alt-delete the flavor of whatever you’re eating.